Don't think I've seen anything quite like this before but I can certainly understand why the previous owner called it "Ghost". 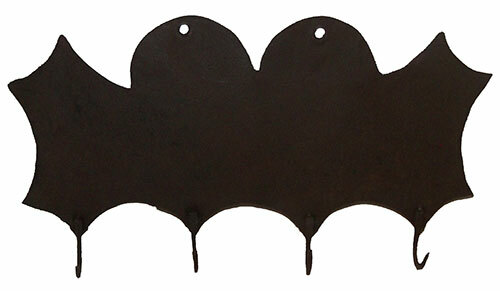 Here we have a 4 hook hanging rack of a nice small size and a lot of personality. 14 inches wide and 8 inches tall as it hangs here. Whatever you want to hang on it will naturally increase the length. Hearth utensils, herbs etc. We can help there as we have a good assortment. Great patina and color . . .minor surface rust that was cleaned down long ago so it presents itself beautifully and gives a bit of texture to the surface. Nothing major, but honest, expected, in-use wear. Circa 1760-1800.